Dino is a black cat with fashionable red stripes that leads a double life. By day he pretends to be a normal pet, living a luxury life with Zoe, a little mute girl whose mother, Jeanne, is a detective in the Parisian police force. But at night he sneaks out the window to follow and help Nico – a slinky cat burglar whose fluid movements and dexterity are poetry in motion. Nico steals money and jewellery, evading captors with ease and slips and swishes from rooftop to rooftop across the Paris skyline. Dino loves it as well. Still everything what is so good cannot last forever. 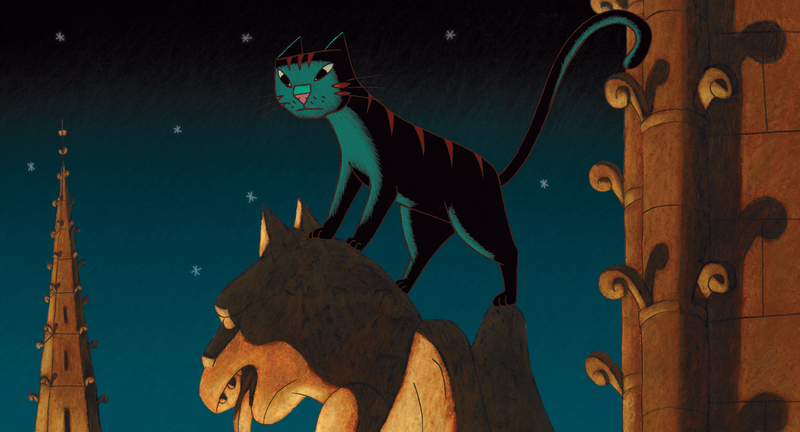 One night the cat’s two worlds collide when young Zoe all of a sudden decides to follow Dino – and falls into the hands of Victor Costa. Costa is a blustery gangster planning the theft of a rare statue, soon to be displayed in a Parisian museum. Zoe’s mum does her damnedest to prevent the theft and catch him. Now the cat and the cat burglar must team up to save Zoe from the bumbling thieves, leading to a thrilling acrobatic finale on top of Notre Dame. Will Zoe speak again? A 2012 Oscar nomination for Best Animated Feature, this movie is very different from your ordinary Pixar/Disney fare (read: it is hand-drawn as opposed to CGI).Its style from time to time reminded me of paintings of Marc Chagall, Amedeo Modigliani and, more generally, Art Deco – strange but charming at the same time. Anyway the old-school animation which doesn’t deal with photorealistic backgrounds was very refreshing to watch although I did need a moment or two to get used to it. The colours were surprisingly vivid, particularly a midnight violet sky with pale yellow stars, and the characters – full of quirky detail: feet were tiny, angular and pointed; women’s breasts, perfectly circular, bob up near their shoulders; Dino’s nose, usually held high, is a delicate shade of light purple. I admit the movie was breezy entertainment, boasted by some imaginatively designed sequences and a sly sense of humor (surely the henchman Monsieur Hulot is so named in honor of the great French comedian?). The movie officially revels in Paris but it is a very schematic Paris of another era. If it wasn’t for the Notre Dame Cathedral and the tell-tale Eiffel Tower you could say it was set in any big city. 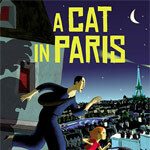 Some of the action (and violence) in “A Cat in Paris” borders on the jarring, and overall I found the plot a bit too simplistic to suit me (but hey, it is a children’s movie, right?). It was especially funny that you could tell who was a ‘white hat’ and who was the villain just observing the shape of the characters’ eyes with 100% accuracy. It kind of ruined all the surprise element for me. The slam-bang finale — set atop Notre Dame Cathedral, where else, lacking just the hunchback — definitely favors bombastic effects over wit. Still getting there is a lot of fun, in part because the animators take time to make Dino a truly charismatic animal. And the movie includes one of the prettiest animated traffic jams I’ve happened to watch. A nice, original movie to watch with your children – but I admit rather those younger ones or those old enough to be already artistically inclined. It is a pity the directors didn’t make the plot more complex to accomodate the tastes of a slightly older/more demanding audience. If you get bored, watch closer the animation – you might find many entertaining tidbits to carry you through this one. I do love stories about thieves, and this looks cute. Is it just me, or are there a disproportionate number of cat burglars named Nick or Nico in fiction? Oh that one. He should be called Odin but I suppose Nick suits him as well, the sneaky dude ;p.